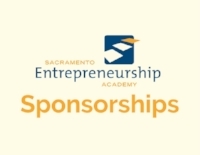 Are you interested in supporting the Sacramento Entrepreneurship Academy? We have several sponsorship opportunities, such as the 2018 Fellows Graduation Celebration. Recognition on SEA Website home page. Prime recognition at the annual graduation event, invitations, programs, signage, and by the host. The Class of 2018 Graduation Ceremony will be held on Monday, May 14th at the Casa Garden restaurant. Please go to the Sponsorships page on our website or contact sea@sealink.org for more information.